Came across a news article titled, “Pastor Pitches Tithing as a Budget Solution” in my daily browsing across the internet. 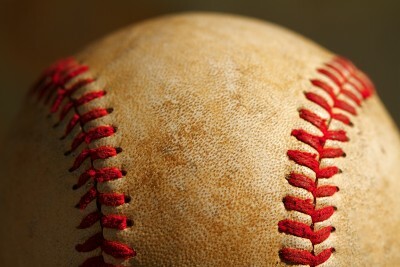 You can read the article here from TwinCities.com. Ok, the gist of the article talks about how tithing has been declining, but there’s one statement in there that strikes me. How embarrassing for God. The rotten, stinkin, filthy government is now his representative. The Church has passed on the torch. 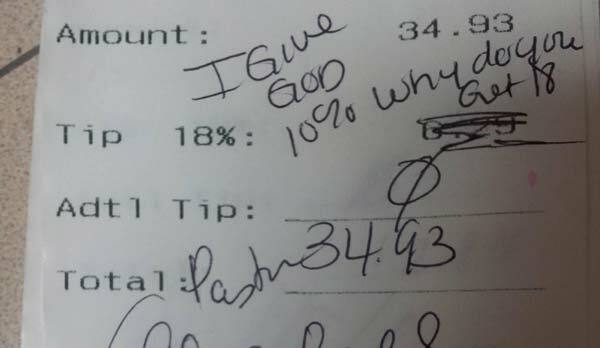 If i was God, I’d be shaking my head in shame. I’d be embarrassed. No wonder giving is down in the Church. Until we’ve learned what we are called here to do, then why should God trust his Church with more money? Giving, feeding, and serving the poor was the hallmark of Christ’s ministry while on earth. On top of that, one of his last accomplishments before leaving the earth was destroying the temple, but we’ve defied his actions and re-resurrected the temple and neglected the poor. The problem we have is in the title of this article. We think we need solutions for “our” budgets. We think that the lifeblood of our church is our budget, our buildings or our programs. When these things are deficient we think that our mission is being compromised because of lack of funding. I wish i could go back to the early church and see how simplistic giving was. Taking care of needs was the number one goal of giving. Now we literally have book stores, coffee shops, amusement parks, malls, theaters, and fitness rooms that have jumped on the band wagon of “needs”. And it will not stop there. The future holds more and more possibilities that will rob the poor. A song by the band Wax written after the 1987 Jim & Tammy Baker and Jimmy Swaggart scandals. Interesting Lyrics from a non-christian band about what they see in televangelicals and politicians. With fire and brimstone eyes. Thrown to your knees and made to answer. As mad men I’d say Amen. Interesting blog, Jared (I clicked over from the link you left in your comment on my site). I definitely disgree with you regarding tithing, and I believe that tithing is an important aspect of the Christian faith. 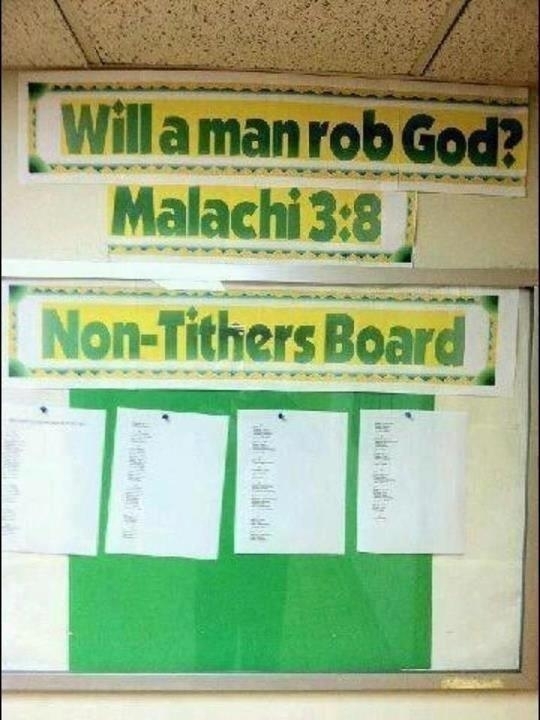 Have I always been good at tithing? Absolutely not – in fact, until this year my giving as paltry. However, for 2008 I decided I *needed* to give 10% of my gross salary to a tithe. Tithing is a statement of faith – my family needs every dollar we earn, and yet by giving 10% of my gross earnings, I’m giving a portion of what God has given me back to Him as a show of my trust that He will provide for my family. And He does. My tithe goes to a small plant church in New Jersey that started its ministry last year. They have only ~30 people in their congregation in one of the most expensive areas of the country. My tithe goes to help their ministry grow and reach the lost. I also do not begrudge churches that have bookstores, coffee shops or large television monitors. You sound as though you resent big churches. However, big churches have quite an impact on their community. I belong to a large church in NC (about 6,000 people attend on three campuses in the metro area). Our church works with over a dozen charity groups in our local community, as well as several international mission groups. My church spearheaded a campaign last year to raise money for supplies for the refugees in Darfur – several folks from our church flew to Africa with the supplies that our church paid for and packaged, and helped hand them out. We didn’t work with a charity group on that project – this was a personal conviction of our pastor, and he spearheaded the whole thing with the church’s blessing. Through our gifting we raised over 1/4 million dollars which resulted in CARE packages for over 3,200 families in Darfur – and each package was personally delivered by a member of our church. Lastly, if all Christians tithed their 10% then the government would not NEED to be involved in helping the poor, homeless, forgotten. My church’s budget is in surplus every single month, and to my knowledge any OVERAGE is immediately put to work in the local community through various programs to help the less fortunate. That overage is earned not only through member tithing, but through the bookstore, the coffee shop, etc. So I wouldn’t be so quick to judge large churches which prosper. Because large churches with good stewards can do great things in God’s name. Hi Jaynee, I am a former member of Hillsong in Sydney Australia and I am not trying to spread rumors or defame anyone. I know a lot about the dealing of Hillsong and their involvement with the Federal Government in Australia. Please do not defend other christians or churches until you the evidence to support your findings. The federal Government withdraw funding of $400,000 from Hillsong and another grant of $950,000 when they found out Hillsong lied and misrepresented themselves to obtain these federal grants. Hillsong receives between 50 to 60 Million dollars in donations ,tithes, and from sales of their Albums annually. Hillsong Confrences is a massive marketing initiative for the purpose of selling Hillsong resources and to get more donations from church members and the thousand of delegates who attend these annual confrences. One of Hillsong Board member (Owner of Gloria Jeans ) was found guilty of breaching contract and was odered to pay $16,ooo,ooo dy the Supreme Court for not honouring the contract agreed with a US based Company who supplied their coffee.The Judge even commented that all the evidence and statement made by the Hillsong board member was fabricated and his statements were not credible and he added that he does not believe in any of the (Hillsong Board members) defence arguments or excuses for not honouring the contracts they sighned. Hillsong and most of the Mega churches are just fronts for big business, and you need to be sober and level headed not to be caught up in the emotionalism used to manipulate people to part with their hard earned money. Please do not be offended , I am not trying to destroy anyones reputation or accuse anyone of fraud. I have studied the bible concerning tithing, and I have to admit that you have to totally ignore scripture or you are out their to delibrately defraud christians to give you or your church money tithes after reading Deuteronomy 14:1-29,Malachi 3:9-10, Mathew 23:23. Jesus said to pay the tithes but he mentioned food not money. He was betrayed for 30 pieces of silver not mint, arnise and cummin mentioned in Mathew 23:23. I will make this point, The bible said that Satan entered Judas Iscariot and it resulted in Judas taking 30 pices of silver to betray Jesus. How can we justify changing what the bible clearly says about tithing food grown within the gates of Israel according to the Leviticus, Deuteronomy, Malachi, Mathew into gold hard cash ? Money tithing is an abomination and a great sin brought in by satan to deceive many who lust and covet riches from this present world and 10% of our neighbours income. Its very sad what the love of money can make people do.